For those of you with a passion for culture and past civilizations, Sitia and its area has a wealth of treasure for you to discover - archaeological sites, museums and much more, all bearing testament to our rich past. The Minoan civilization, as is commonly accepted, is the first and most ancient great civilization in Europe and here, in Eastern Crete, in Zakros and Palekastro, in Mohlos and Psyra, the first centers and ports of this great civilization developed. Zeus, the king of the Gods, who according to myth transformed into a white bull, seduced and abducted the beautiful daughter of the king of Phoenix, Europe, and carried her on his back to bring her to Crete,to a beautiful beach down in Palekastro, where they stayed to rest,before continuing their route to Diktaio Antro and Gortyna. This beautiful myth&nbsp;has some historical implications on the relationship of Crete with the East, explaining why here, in Eastern Crete, which is close to Asia Minor, Syria, Palestine, ancient Phoenix and Egypt, the first signs of European civilization were born. It is in this place, in the Minoan town of Palekastro, where the famous shrine of Diktaios Zeus was located and where his hymn was found written on a rock. This is the first hymn to peace and peaceful life. Young men prayed to Zeus to come to earth along with the gods of vegetation to bring happiness to humans, peace and order to the world, justice and protection for the young, fertility for&nbsp;the earth and its fruits and winds for the ships. 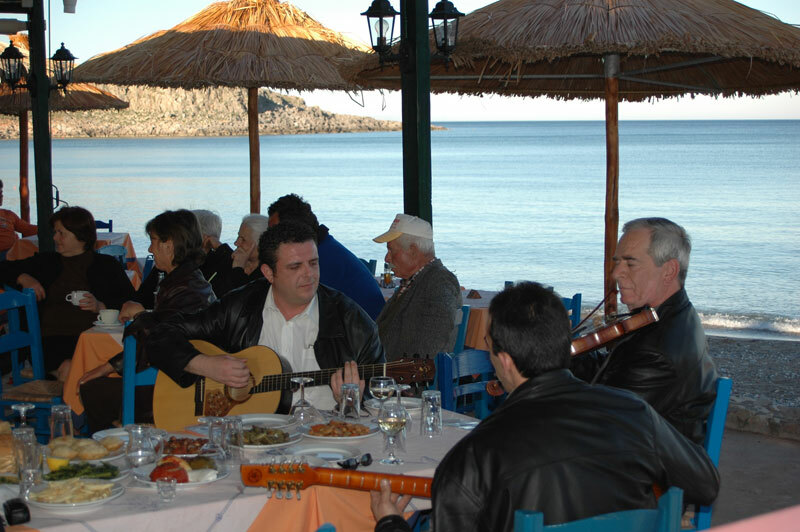 Melina Merkouri noted and said: "still today, Sitia is the home of pleasure, happiness, and creativity. A place where life finds its meaning. A place that proudly continues a great tradition of offering in literature, sciences and art". A trip to the Sitia areais a trip to the roots of the European civilization. Europe without Greece is like a child without berth of certification!!!!!!!!!! The province of Sitia is one of regions of Greece and of the whole world with a large number of antiquities within its borders, with archeological sites such as: The Minoan palace of Zakros, the Minoan town of Palekastro, the Minoan settlements/naval centres of Mohlos and Psyra, the Minoan cemetery of Aghia Fotia, the Minoan palace and settlement of Petra, the Minoan villas in Sitia, in Zou, in Pano Zakros, Achladia, Aghios Georgios, Makris Gialos, the residence Hamezi, the eteocretan Praissos, the Doric Itanos, the Hellenistic settlements of Trypiti and Xerocambo, the Roman Lefki (Koufonisi) the medieval settlement of Voila, the Kazarma fortresses of Sitia, the Venetian villa in Etia, Liopetro, Monte Forte, the monasteries of Toplou, Kapsa and Faneromeni, Byzantine churches, frescoes and icons, historical sites, folk architecture, traditional fountains, neo-classic houses, watermills, windmills, farms and many more monuments of local, national and global cultural heritage. The extremely rich and bright past of the region is certified by the&nbsp;numerous archeological excavations and historical research conducted by Greek and foreign researchers over the last 100 years. The Palace of Kato Zakros is one of four Minoan palaces to be found on Crete.&nbsp; It is situated 45km east of Sitia, in a sheltered bay on the east coast, oriented politically and comercially towards the major civilizations of the Middle East. The first excavation in Kato Zakros was performed by the British D. Hogarth, in 1901, who discovered&nbsp;the remains of a Minoan settlement , indicating a flourishing society. He unearthed about 300 clay stamps on coins, indicating some sort of bureaucratic system of control or a number of commercial affairs. Some of these stamps originate from Knossos,&nbsp;which indicates the close relationship of Knossos and Zakros, at least during the 15th century BC. In 1962, the Greek archaeologist N. Platon started a new excavation in the valley of Kato Zakros.&nbsp;He was convinced that here was something much more important than a naval settlement - the excavation results were indeed impressive!&nbsp; They revealed a Minoan palace and a settlement surrounding it, dispersed over the slopes of the two hills of the valley. Important findings came to light during the research of the Minoan tombs, most of which were "sheltered" in natural caves, in the gorge of Zakros - &nbsp;renamed "the gorge of the dead" ("faraghi ton nekron") - but also in other positions, such as in "Mavro Avlaki" southeast&nbsp;of the gulf and "Spiliara", on the north slope of the valley. The palace of Zakros - as it is preserved today- was constructed during the 16th century BC. It is possible that it replaced an older public building, as indicated by the remains found under the east wing of the palace. Only at this spot it was possible to further excavate, since agricultural activity during the 20th century - and before the excavations- had totally destroyed this part of the palace. From the palace of Zakros, farm produce, timber and especially handicraft products were sent to the Middle East and Egypt, with ivory, precious metals and semi-precious sones being imported. Life in this bustling palace came to an end in about 1450 BC, when the palace was destroyed, possibly by an earthquake or the eruption or the Thira volcano. The palace is made up of a central courtyard, surrounded by wings of buildings with a maze of corridors and a vast number of rooms. Many of the buildings were multi-storied, with interior staircases and light wells. Since the palace was built on very wet land, water was always a major consideration and the palace features a number of drains, a cistern and a fountain. The Minoan villa of Pano Zakros was studied by N. Platonas, with the aid of his then associates, Giannis and Efi Sakellaraki, in the years of 1965 and 1966. The chambers of the ground floor were mainly used for&nbsp;production and storage spaces for agricultural products. One of the chambers housed one of the most impressive Minoan wine presses, with two press basins and vessels to collect the product. Next to the wine press, a spacious storage room was found, along with six large tubs. One of the tubs beared a Linear A inscription, that started with the ideogram of the wine. Petra is a traditional settlement, 1 km east of Sitia. A small tower from the Venetian period can be found there. It bears the name "house of Kornaros" and belonged to the homonym family. On the hill over the tower, a small palace and a settlement have been brought to light by recent excavations. The rooms of the palace were luxuriously adorned and its walls painted with bright colours. Many pots, vases and epigrams of Linear A and B were found as well. Under the road of the contemporary settlement cyclopean fortifications were found, while in the fringes port installations were also found. In the adjacent hill "head of Petras" (east of the palace towards the sea) a Neolithic settlement is being excavated. Recently, the settlement of Petras has been transformed into an important archaeological site well-worth visiting during the summer months. Praissos was once one of the most important regions of Eastern Crete. It was built on three hills and was surrounded by a strong fortification wall, parts of which still remain, in particular on the northeast of the big hill, where the chair of the city's authorities was located. The third hill with the altar-shrine and the holy cave at Skales was located outside the fortification. After the conquest of Crete from the Dorians in the 12th century B.C. the Eteocretans, who were the first inhabitants of Crete and the "native Cretans", withdrew towards the east of the island, where they kept their genuine Minoan character, their language, religion and the worship of Diktaios Zeus. Praissos was located at the centre of the Sitia peninsula and had harbours in the Northern sea, the Cretan sea, in Iteia (Sitia), in the Libyan sea, in Styles, as it appears in the resolution of Praisians, during the Macedonian years, concerning fishery and the trade of the red shells and the navy. The Ierapytnians, who were of Dorian origin, after many of years of war finally defeated the Eteocretans of Praissos and destroyed their city. The region was probably inhabited since the Neolithic period. In the cave located in Skales, by the river banks of Kalamauki and Panteli, Neolithic and caramaic ceramics were found. In 1884, Federico Halbherr discovered in Praissos the first Eteocretan inscription and found a large number of clay figurines. The excavations of the Brittish Archeological School revealed that in Praissos there was a city of the historical Hellenistic times. The more ancient Eteocretan city of Praissos, recorded by the ancient Greek historian Stravon, was far from the remains preserved today and after its destruction, the last descendants of the Eteocretans, along with the Dorians, built the new city in the 12th century BC. It is the remains of this new city that are still preserved today. The region of the "state" of Praissos occupied the whole peninsula of Sitia -apart from Itanos- which was then called the Eteocretan peninsula, the peninsula of Praision. The regime of the Hellenic-Geometric Praissos was democratic. In the position of "Souvloto Mouri", in 1903, the excavations under the direction of St. Xanthoudidis brought into light a building of the Minoan period. Its unique elliptic form -uncommon for the period- and its function, puzzled the archaelogists for many years. In I971, a new research conducted by the Professor Mr. Dabaras revealed new evidence that this building was in fact a residence, of unique style in the Minoan period, dating back to 2200-2000 B.C. while the remains of more ancient residences have been found. During the excavations cupreous objects were found in the exterior of the residence, while in the rooms vessels and some figurines have been found, which are saved in the Museums of Heraklion and Aghios Nikolaos. In the position "Riza", in 1952, I. Platon attempted to perform a small excavation on a point where an ancient wall was visible. During the excavation the external walls of a habitation were revealed, which were made by large carved stones. In 1959 Platon continued the excavation works and uncovered the whole building, which proved to be an important agricultural villa of the Minoan period. It dates back to 1600-1550 BC, and was used for at least half a century until it was destroyed, probably by an earthquake. The building covers 270 square meters and includes 12 chambers. The main entrance, with a monolithic sill, was in the east, while another entrance was in the west. The reception hall in the left of the tiled pre-chamber had a double entrance and communicated with a smaller chamber with a built bench and had three columns supporting the roof. Another possible reception hall was on the right of the pre-chamber. The villa also had a kitchen, storage rooms and other secondary spaces. In the exterior, the walls shaped a yard that was probably used for animal housing. Numerous excavation works have been performed in two locations in Achaldia, where visitors can see two wonderful sites of the Minoan civilization, the unique domed tomb of Eastern Crete and the remains of a Minoan villa. In the position "Platuskinos", and underground domed tomb with a hall passage has been excavated, the only sample of a domed tomb of the copper age in Eastern Crete and extremely rare in the whole island. It dates back to 1400-1220BC and it was used for more than a century. A built passage 9 meters long leads to the entrance of the tomb. The chamber is circular with a diameter of 4,08 meters and height 4,16 meters. The dome is build with large stones and is cone-shaped. Right across the main entrance of the tomb, there is a second smaller entrance, which was possibly a symbolic opening for the passage of the dead to the "other" world, but it could also be the entrance of a side chamber which was never fully constructed. The lintels and the sills of the two entrances are monolithic. The cavities around the main entrance probably functioned as the support of the wooden gate, which was closing the entrance to the tomb. Due to its similarity to the Mycenaean domed tombs of Northern Greece, it is often argued by some researchers that the technical construction of the domed tombs of the post- Minoan period was "imported" from Mycenaean technicians of mainland Greece. At the beach of Palekastro, in the position of Russolakos, a great and big town of the Minoan period was excavated. It flourished during the post-Minoan period but some remains date back to the pre-Minoan period and the mid-Minoan period, mainly tombs with numerous bones very well preserved. The anthropologists that studied the bones found important information on the body structure of the Minoans, who reportedly had an average body length of 1.60 for men and 1.50 for women. A central road connects with 4 other roads that divide the town in 9 districts. The houses that face the central road had imposing fronts, while a complete drainage system was functioning in all the districts. Itanos had been one of the most important coastal cities of eastern Crete from the Minoan years until the first Christian era. Nowadays it is known under the name of Erimopolis. Its citizens were dominating throughout the coast of Sitia, from the Samonion cape (today cape Sidero (iron)) to the Erythreon cape (what is today called Goudoura) and the island of Lefki (Koufonisi). Itanos is also mentioned by Herodotus. When Pythia saw the oracle and told the Thyraeans to make a settlement in Libya, the latter sent emissaries to Crete in order to find guides who would lead them to Libya. The emissaries on their arrival to Itanos met with a laver fisherman who recounted to them how he had once drifted away pushed by the wind to the land of Libya. In turn they convinced him to guide them there where they ended up funding the colony of Cyrene in 630 B.C. Itanos is also mentioned by Stephanos the Byzantine who reckons that the city's name finds its origins in the Itanos Phoenix. According to him, Itanos was a Phoenician colony controlling the laver and glass trade. It was in this city that the Phoenicians merchants, who traded with Crete, were based. Numerous laboratories for fish and laver processing, glass making and textiles were also found here. Itanos had always been a Syrio-Phoenician station where Phoenician gods such as Phoenix, Amfion and Tagha were worshiped. The city has been a very important port as it was used as a transportation base between the East and Crete. Thanks the trade of laver, glass and fish, as well as the great income generated by the Diktaion Zeus temple, Itanos became a rich and prosperous city as one can infer by the great number of temples and luxurious marble structures that have been found here. Still, it was its affluence that led to their subjugation by the Dragmians who before rising up used to be controlled by the people of Itanos. Furthermore, when the Ierapytnians destroyed Praesos, Itanos was contained even further. After the Roman occupation of the whole island, Itanos managed to flourish thanks to seafaring and trade. The city minted its own currency that had the tridents, fish and even Triton (ancient eastern Cretan deity) as was to be expected by a seafaring city. Many of these coins are described by Sboronos. During the proto-Christian period, several glorious and gallant temples were erected as indicated by their ruins. Itanos was either destroyed in the 9th century A.D. by the Saracens or by the great earthquake in 795 A.D. The city must have been populated once more but was finally looted and utterly destroyed by pirates sometime during the 15th century. Its residents retreated to safer mountainous settlements. The regime of Itanos was initially monarchy but later became democratic with its own senate and open parliament ("ekklesia tou demou"). Sometime during the 3rd century B.C. there was an attempt to overthrow the aristocratic democracy. The citizens of Itanos asked for help by Ptolemy the Philadelphian of Egypt who sent the general Patroclus the Patron to their aid. In Itanos several sepulchral epigrams from the proto-Christian period have been found. On the transom of the Saint-John's temple one can find an epigram from the 3rd century B.C. describing how Itanios competed and equaled in archery the god of light and music, Apollo. In 1919 an old tomb was found, covered by two plaques that can be found in the Archaeological Museum of Heraklion. These plaques were made of locally extracted blue rock. The first epigraph comes from the 2nd century A.D. and consists of 98 verses badly damaged, that describe the conflict between the Itanians and the Ierapytnians over the Diktaeon sanctuary. The other epigraph contains a resolution from the 3rd century B.C. voted by the Itanians thanking the Macedonian general Patroclus the Patron. Itanos is also mentioned with the same name (u-ta-no) in the linear B inscriptions found in Knossos. In the area of Cape Sidero, the people sailing to the East worshipped the gods of the winds, that were later substituted by Poseidon. The ancient name of the island was Lefki and it played an important role in the Hellenistic and Roman history of Eastern Crete. Its citizens were mainly fishermen and laver makers. The art of laver processing was known in the area since the prehistoric times as can be seen by the processed laver shells found in Minoan settlements. The laver trade was very lucrative. In 1975 in the same area, N. P. Papadakis excavated a Hellenistic theater with a capacity of 1000 spectators. The orchestra was semicircular and its corridors were vaulted. The second most important edifice found was the public bath house dating from the 1st century A.D. In the ancient Lefki settlement that is located close to the theatre, several houses operating as laver processing laboratories were also found. A mansion with numerous rooms, mosaics and colourful walls was also found. All findings, such as figurines, stone and metal vases are kept in the Archaeological Museum of Sitia. In the top of a hill, around 2 km from the settlement, the ruins of an ancient temple were also found, along with two remaining pieces from a colossal sitting statue. The water-supply system consisted of three built aqueducts bringing water from a spring on the top of the hill to the centre of the settlement. It seems that the whole area was violently destroyed during the 4th cent. A.D., while the theatre was looted and burnt. Since then the island has not been permanently populated again. Only passing sailors left their traces in the small caves of the western beach, where engraved on the rocks one can find Christian Saints' figures dating back to the 17th century. Today, the whole island is a vast archaeological area. The American archeologist R.B. Seager discovered Mohlos in 1907, after following the instructions of a local fisherman. The following year, the excavations began on the little island, which revealed 20 built tombs and about 12 habitations. In 1955, J. Leatham and S. Hood cinducted underwater searches and found Roman fish tanks at the coast across the island, supporting the hypothesis that the island of Mohos was a peninsula during the copper age. According to the findings of the excavations, the island of Mohlos developed to one of the most important centers of the Minoan civilization. The valley ashore provided a rich agricultural production and the narrow strait that united the island with the shore in antiquity was forming two natural ports, keeping the ships safe in any weather condition. As an important commercial center, it imported obsidian from the island of Milos and other raw material from the East, which were further supplying other regions of Crete. The discovery of a circular stamp that comes from north Syria and dates back to the 18th century, proves the significance of this port. In the 'district of the craftsmen" golden jewelry was constructed, along with stamp-stones, and the famous stone vessels of Mohlos, many of which were found in tombs of the period. After the destruction from the volcano eruption, the town of Mohlos was reconstructed and expanded. The new town had central roads and other smaller roads that divided the town in districts. The houses were built in different levels, adjusted to the inclination of the ground, and had two or three floors. During the last phase of the extended habitation on the island of Mohlos, a 1st century fortification is constructed at its north and east part. The fortification was probably an effort of Ierapytna to establish its presence on the north coast of Crete in this period. Recent surface excavations have proven that the area has been populated since the prehistoric times and is of great archeological interest. In the site of Katsounakia a large Minoan settlement was found but has not been excavated yet. In the hill of Trachelas a sanctuary was also found but had already been desecrated. Furthermore, in the area of Psile Ammos one can see the ancient stone quarry that was used to build the ancient city. There are also numerous salterns used for sea salt production. They consist of a series of canals and founts that are dug in the rocks of the seashore. Today they are mostly covered by the sand of the beach. Across from the Kabaloi area one can find a series of islets with installations dating from the post-Minoan era (1500-1300 B.C.). Also in the Farmakokefalo area important excavations started in 1984 by the archeologist N. P. Papadakis. An important Hellenistic city was found which is speculated to be the ancient city Ampelos, spanning throughout the contiguous hill and surrounded by high city walls. Only part of the city-walls is still preserved. Many houses, roads and other findings have come to light uncovering an important part of its history. The city was built sometime during the 5th century B.C. and flourished during the 3rd-2nd century B.C. There was trade with other Cretan cities and the Dodecanese; especially with Rhodes and Kalymnos. Characteristic findings include lead pellets used by the slingers of the army. The excavation findings are kept in the Archaeological Museum of Sitia. Finally, in the centre of the city the small church of Aghios-Nikolaos dating from 1895 can be found. In the position "Plakakia", west from the village of Makry Gialos, archeological excavations revealed a villa that dates back to the post- Minoan period. The villa that was revealed is very important for the study of Minoan architecture because it constitutes micrography of a Minoan palace. In the middle of the building there is the big central courtyard, surrounded by the remainder spaces of the villa with slab paved floors and walls covered with mortar, while there is also a western courtyard. 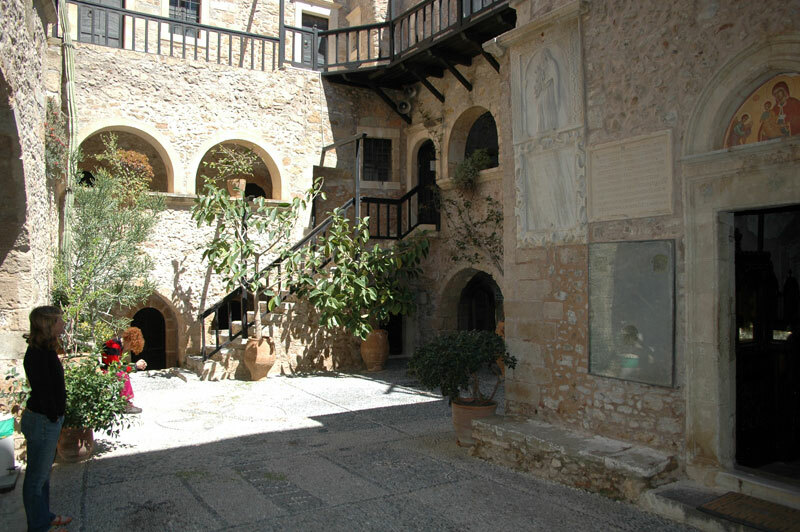 In the central courtyard there is a built altar and next to it a stamp stone was found with arepresentation of a holy boat, a holy tree and a priestess. The roof was set with canes and clay, which is exceptionally interesting as it connects the Minoan with the later Cretan architecture, since this method was used until recently for the construction of the roofs of rural stone-built houses. The villa was destroyed by a big fire, as it is proved by the imprints of burned wooden joists and the blackened slab paved floors. The architecture style of the villa, the small number of spaces for domestic use, and the importance of certain findings (figurines, stone stamps and a bowl of Holy Communion), all of which are accommodated in the Archaeological Museum of Aghios Nikolaos, indicate that the villa had a religious character and it is possible that it constituted an important religious centre of the wider region. In the position "Katovigli", in 1976, systematic excavations began under the direction of N. P. Papadakis that were completed in 1980. The ruins of Roman villa were then revealed, that had a bath complex and an outdoor water reservoir. The design of its spaces is quite complicated. Corridors and courtyards function as central axes surrounded by rooms and auxiliary spaces. The floors and the walls of the central rooms are covered with marble plates. The entrance of the villa had a mosaic floor with geometric and plant decor. A large chamber with luxurious floor was probably used as a reception hall. In the south-eastern department of the villa the bath complex was located, also known as "valaneio", with a petal-shaped swimming-pool whose floor and stairs were set with marble. A large mosaic with geometric representations was found in the outdoor space next to the swimming-pool. In the villa there was a system of build pipes, which channelled the water from the reservoirs in the "valaneio" and in the remainder spaces. Between the various spaces of the "valaneio", a room was located which probably had some sort of burrial use, where bones but also entire skeleton were found. The villa was inhabited from the 1st century B.C. until the 3rd century A.D. The cause of its destruction is unknown. The few findings of the excavations are accommodated in the Archaeological Museum of Sitia. the Neolithic Age and the Minoan period to the New Age. The civilizations that have flourished the grounds of Sitia, one of the richest areas in archaeological sites internationally have bequeathed us magnificent samples of material and intellectual wealth that are exhibited in the district Museums and Collections. The palace at Zakros is the fourth in terms of size, among the Minoan palaces. It was located at an advantageous strategic position, at a protected bay, and was the centre of commercial exchange with the countries of the East, as is indicated by the excavation finds (elephants' tusks, faience, copper etc.) It has two main building phases: the old palace was built in c. 1900 B.C., and the new one in c. 1600 B.C., but was destroyed in 1450 B.C. along with the other centers of Minoan Crete. The palace was the administrative, religious and commercial centre, and was surrounded by the town. After its destruction, it was not rebuilt and the site was used only for cultivation. Burials have been uncovered inside caves on the slopes of the "Ravine of the Dead", as the ravine that stretches from Pano Zakros to Kato Zakros is called. The English admiral Th. Spratt in his book "Travels in Crete", published in the middle of the 19th century, mentions to have seen ancient ruins in the area. At the end of the 19th century, the Italian archaeologists F. Halbherr and L. Mariani, and the English A. Evans conducted trial excavations in the area. The first systematic excavation was carried out in 1901 by D.G. Hogarth of the British School of Archaeology, who excavated two deposits and houses that suffered severe destruction during the Second World War. Hogarth came very close to the palace but did not uncover it. Sixty years later, a few gold ornaments given by a peasant as a "gift" to doctor Giamalakis, and remodelling works in the area that brought to light ashlars blocks and a sword, in 1961, led N. Platon to start systematic excavation, with the financial support of the Americans L. and H. Pomerance, bringing to light the palace and the settlement around it. The finds from the excavation are exhibited in the Museum of Herakleion, while a few are kept in the Museums of Sitia and Aghios Nikolaos. The dining area has recently been adorned by the icon painter Manolis Betinakis using fresco. A new event which takes place in June in the central square of Piskokefalo. It includes concerts of music. Takes place in the central square of Tourloti in June. It includes concerts of music. Organized every two years in the last week of June. It includes boat racing and concerts of music and dance.